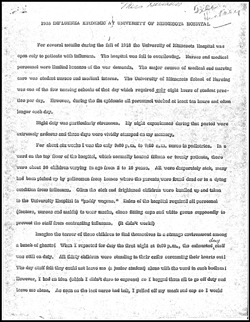 In the fall of 1918 the University of Minnesota Hospital was closed to all patients except those ill with influenza. This included the pediatric ward. At the time, Pearl McIver was a student nurse earning her practice hours during the pediatrics night shift. According to McIver, the regulations of the unit required all personnel to wear a cap, mask and gown and restricted holding the children. The children were frightened and sick. Left alone on her first night, McIver removed her mask and cap and began wrapping each child and rocking them in her arms until they calmed down and took fluids. She would spend her night working her way through the ward of approximately 30 patients. One night, she was interrupted by an intern whom she thought would expose her. Instead, he offered to help. McIver kept her method of care during the influenza outbreak a secret for years until a chance meeting with the intern who was now a pediatrician. McIver graduated from the School of Nursing in 1919 and continued to work at the University Hospital until taking a position with the United States Public Health Service in 1922. She retired in 1957 after serving as chief of the Division of Public Health Nursing. Since then, her story has been told and re-told numerous times including by James Gray in his book Education for Nursing and Katherine Densford in her tribute piece to Pearl McIver in the April 1962 volume of the American Journal of Nursing. However, these two accounts are the re-telling of McIver’s story, paraphrased and embellished. Below is a particularly poor mimeographed copy of the story that Pearl McIver dictated on July 3, 1958. It is the source used by both Gray and Densford, but it is her first-person account. The story as she told it. 1 Comment on "Pearl McIver"
Eric…I deeply appreciate your comments re. Pearl McIver. This well-known story about her way of dealing with ‘rules’ really exemplifies one of the attributes of nursing…..doing what is best for the patient first. This story didn’t get the attention we might have given it during the recent centennial. By highlighting it, I will be bringing it into my disussions re. nursing history when I talk to students. Thanks.